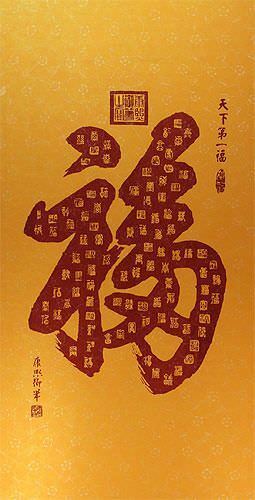 Artwork Panel: 67.3cm x 132.5cm ≈ 26½" x 52¼"
Silk/Brocade: 76cm x 187cm ≈ 30" x 73½"
This is a unique wall scroll that features 100 different ways to write "fu". Those 100 "fu" characters are embedded inside a huge "fu" character. This character means good luck or good fortune in Chinese, Japanese Kanji, and old Korean Hanja. This is a great thing to hang, or give as a gift for Chinese New Years. This one is actually printed from a carved wood block. This style is related to ancient ink rubbings. The result leaves a relief print (the printed portion is raised slightly leaving an embossed feel to the artwork). When complete, the artwork was mounted to a silk brocade wall scroll by hand at our workshop in Beijing. The artwork is not signed per se, in fact, the print block has some artist info, but such blocks far outlive their creators. Therefore the person who made this print by hand, is not necessarily the same person that carved the block of wood. Also, these pieces are created more for decor, than to be considered works of art, so it's common for the artist to remain anonymous.